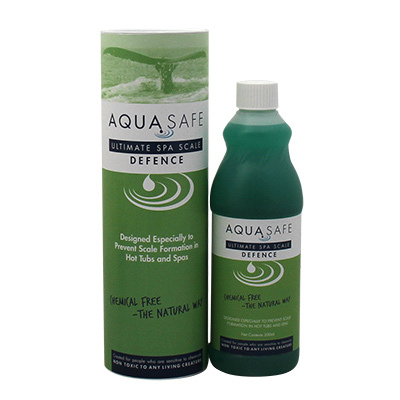 AquaSafe90 – this remarkable formula keeps your water clean, sparkling bright and fresh with no irritating odours. The powerful yet gentle cleansers remove contaminants to eliminate unsightly scum and foam and prevents scale or mineral deposits from forming. Forget the shower after use, as AquaSafe90 leaves your skin feeling clean, soft and velvety smooth. This is a two-step process. Unless your spa is brand new, you will need to remove all excess build-up of contaminants in your spa’s system by using AquaSafe90 Spa Cleanser before using AquaSafe90. We suggest you do not use the spa during the cleanser process. 1 Remove your cartridge filter for the duration of the cleanser process. We also recommend you clean or replace your filter at this time. 2 Shake bottle well before use and pour the AquaSafe90 Spa Cleanser into the old water. If the spa is 2-3 years old or more, use two bottles. 3 Let the spa circulate with the water temperature between 35-37ºC for a minimum of 8 hours per day, for 5 days. 4 After 5 days, drain the old water from the Spa – when the water level reaches the footwell use a hosepipe* and add fresh water whilst still draining. This will flush the water from the lower pipework, do this for 10 minutes, clean and refill Spa. 5 Clean both sides of the cover with some of the AquaSafe90 and rinse thoroughly. If the cover has any breaks or tears, we recommend it be replaced. If your spa cover has a zipper closure it is important to unzip the cover (DO NOT REMOVE THE COVER – IT’S DIFFICULT TO PUT BACK ON), and flush the inside with your garden hose. The inside has been known to harbour moulds, mildew and bacteria – all of which drip from condensation through the cover back into the spa water. 1 Shake bottle well before use and add a 500ml bottle of AquaSafe90 to spas of 1200 – 2250 litres. If your spa is less than 1200 litres add 375ml. 2 After the water has reached the desired temperature (35-37ºc), check the pH level to ensure it is in the range of 8.0 to 8.4. 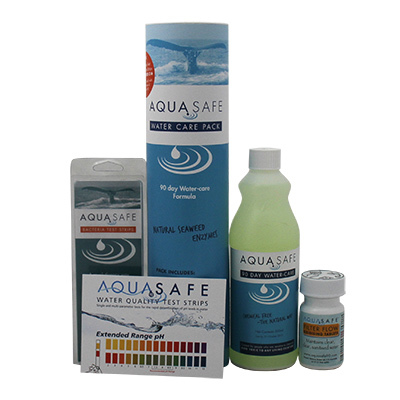 You initially may need to check your pH levels on a weekly basis, although the AquaSafe90 should maintain the level automatically. 3 Rinse your filter every week or more frequently – based on bather usage. Use a jet attachment on the hose pipe to rinse thoroughly. Soak the filter in a filter cleanser overnight every 4 to 6 weeks, rinse with water and allow to dry before replacing. 4 Drain and refill your spa and add AquaSafe90 every three months. Don’t forget to use the Reminder Card attached. We recommend the weekly use of SeaKlear Natural Clarifier Product to keep your water sparkling clear. After each application of SeaKlear run the spa for 20 minutes. ENJOY a completely natural, low maintenance, skin conditioning product, made exclusively for the hot tub industry! 1 Wash the filter using jet attachment on hose pipe. Alternate filters if you have two. 1 Use Bacteria Test Kit to check water is clear of bacteria. 2 Check pH level and adjust if necessary. 1 Soak filter and cleanse with AquaSafe Filter Cleaner. Set your spa to filter ideally for 16 hours per day – consult your owners manual or telephone for instructions. On lower filtration times of 6 hours per day or less, you should consider using a disposable filter – they are 50% more efficient and do not need any regular cleaning. Rinse your filter weekly and allow to dry before replacing. Clean filter every 4-6 weeks in a recommended cleaning solution. Keep a dedicated swimming costume for Spa use – just rinse after use. Do not wash these in detergent and this will prevent any residue entering the spa water. Shower before using Spa – 80% of all water contamination comes from the body. A large number of bathers, lotions, oils, deodorants, sunscreens or other products used on the skin, soap residues in bathing suits. Contamination in the water supply or chemical residue from the pipes. A fragrance has been added to the water. Make sure filters are clean and the filtration system runs at least 8 hours a day. Add some oxidiser or clarifier (such as SeaKlear Natural Clarifier). If a fragrance was put in the water, the tub must be drained and go back to Step 2. Refrain from putting any fragrances in the water with AquaSafe90. If you have an Aromatherapy Pod you can either use beads or herbal oil dispensed on a linen cloth. It may be necessary to partially drain the tub (drain out 25%) and refill with fresh water. Replenish with correct proportion (125ml) of AquaSafe90. Someone with a green bathing suit was in the spa and the colour leaked out into the water. This can happen with new bathing suits. For a high-copper content, use a product (such as Eco 1 in line pre filter) that helps eliminate metal in the water. For green colour from a bathing suit, it may be necessary to partially drain the tub (drain out 25%) and refill with fresh water. Top up with 125ml of AquaSafe90. High iron content in the water supply. 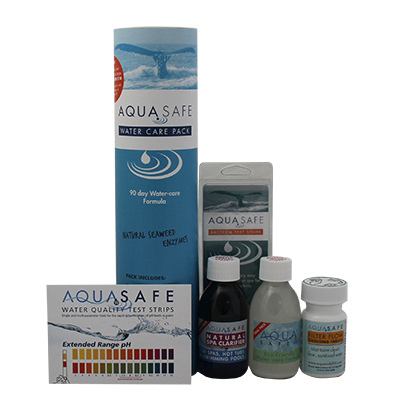 You can test your tap water using the AquaSafe HomeWater Test Kit. Use a product that eliminates metal in the water, such as Metalgon. If you fill your tub from a hose, it is possible to fit the hose with an AquaSafe Pre-Filter filter which removes metals before they get into the Hot tub. We do not recommend using any nonnatural fragrances, as they may not be compatible. 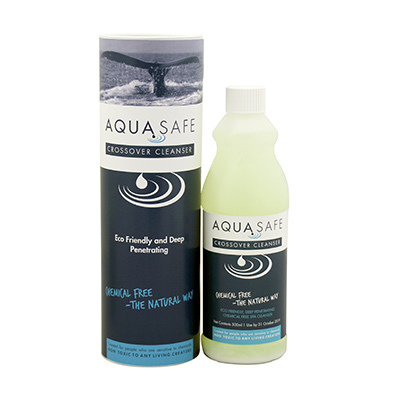 We recommend AquaSafe Aromatherapy Sprays. AquaSafe90 is a positively charged ion. Your tubs’ surface has a negative charge. Once in a 90-day period, they will bond, and you will notice a slight film develop on the surface of your tub. All that you need to do is wipe the inside of your tub with a clean cloth or sponge to break this bond. The great result of this bonding is that it also creates a natural lubricant within your spa, coating your heating element, pump, seals and your plumbing – allowing your tubs’ mechanics to work longer and better. At times you may experience an organic smell. This simply means AquaSafe90 has found contaminants and is working harder. This may suggest your filter requires more frequent cleaning. Make sure the pH is between 8.0 and 8.4. Check to make sure the underside and inside of the cover has been cleaned. If the odour is still present after 24 hours, some SeaKlear Natural Clarifier or an Oxidiser may be used. 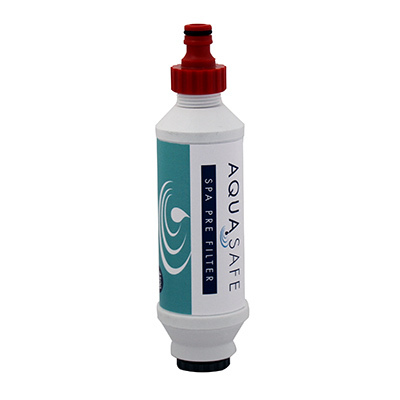 AquaSafe90 is compatible with ozonators, chlorine and bromine. Cloudy water may be caused by frequent use by a large number of bathers, or lotions, oils, deodorants, sunscreens or other products used on the skin or soap residues in bathing suits. Bacteria Test Strips are available for regular home water testing. The AquaSafe Bacteria Test Strip is an antibody based rapid test, that detects Pseudomonas, Aeromonas, E.coli, Shigella, species of Salmonella, Enterobacter, Klebsiella, and many other coliform and non-coliform Bacteria in swimming pools and spas – in less than 20 mins. It has all the accuracy and reliability of a lab test in a disposable strip and requires no instrumentation or user training.